Tomb of Tausert KV 14. Inside Nefertary tomb, Queens Valley. Deep in the limestone hills to the north-west of Deir el Bahri lies a remote valley. Here are the pharaohs of the 18th, 19th & 20th Dynasties chose their eternal resting place. Thutmose I was the 1st pharaoh to excavate a tomb in the barren valley, and to construct his mortuary temple at the edge of the verdant valley. In this way, he believed, his cult could be continued while his resting place remained secret & safe from robbers. Here the most famous tomb of boy King Tutankhamen is situated. After the mummified bodies of the pharaohs had been laid to rest, the passages of their tombs were sealed and covered with rock and rubble. The actual tomb design was relatively uniform, differing only in length and number of chambers. They usually comprised three corridors, one following the other, slopping deeper and deeper into the bedrock. A shaft at the end of the 1st corridor, sometimes dropping to a depth of over 6 m, was a feature of several tombs. At the end of the 3rd corridor there was usually a door leading to an ante-chamber, and the tomb chamber lay beyond this. Its roof was often supported by pillars & the sarcophagus was placed either at the centre or to the rear. In most of the Royal tombs from the entrance doorway to the burial chamber, the walls from floor to ceiling were covered with sacred texts & representations from the mortuary literature known as the Book of the Dead. This had been accumulated for thousands years & included hymns, prayers & magical utterances, as well as ascension texts & resurrection texts. The corridors represented the different stages of the journey of the deceased to the afterlife. The ancient Egyptians had a deeply rooted concept of life after death. Tomb of Thutmose III - this is the tomb of the pharaoh who won an empire for his country & built a great Festival Temple at Karnak in thanksgiving to Amon-Ra for victory. Tomb of Amenhotep II - this tomb is one of the most beautiful in the valley. When the tomb was discovered in 1898 it contained not only the mummy of Amenhotep himself, festooned & garlanded, but other mummified bodies as well, including 9 of royalty. Tomb of Horemhab - this is the tomb of the 1st pharaoh of non-royal lineage to construct his resting place in the Valley of the Kings. Haremhab was the general who seized control at the end of the 18th Dynasty and his tomb is one of the most remarkable, although the entrance is unimpressive. It slopes through two corridors and that were not completed, but which enable us to see the different stages of mural decoration. Tomb of Ramses VI - the tomb was started by Ramses V and usurped by his successor. It has 3 entrance corridors, 2 chambers, a further 2 corridors, one after the other in a straight line, leading to the ante-chamber and the tomb chamber. The wall representations are carried out in painted low relief. 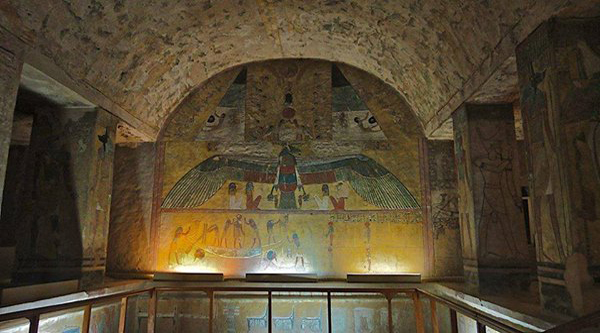 The standard of craftsmanship is not high, but the tomb chamber has one of the most important ceilings in the Valley of the Kings. Names and mottoes in Coptic and Greek show that this "Golden Hall" was an attraction from the 1st century AD.